Those growing apples and wine grapes are faring best. But those who grow apricots, peaches and berries are a bit more concerned. WASHINGTON — The recent nights of freezing temperatures have been both good and bad for Virginia farmers. Faring best are those growing apples and wine grapes, because those plants are budding but not on the brink of blooming, according to the Virginia Department of Agriculture and Consumer Services. “What the cold temperatures will do is delay the bloom, which reduces the risk that they would bloom too early,” said Elaine Lidholm of VDACS. 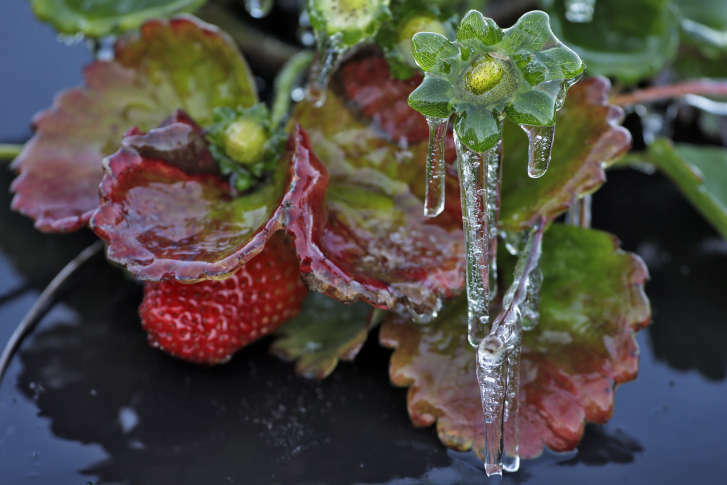 One grower in Winchester, Lidholm said, told her the cold was just what the doctor ordered. As for farmers who grow apricots, peaches and a variety of berries, the cold has them a bit more concerned. Those plants are closer to blooming, which means a freeze could kill the bloom and prevent fruit from developing. “The worst-case scenario would be that a farmer loses his entire crop,” Lidholm said. That is rare, however, because most fields are home to several microclimates, meaning one strip of land could remain warmer than another. Many farmers also employ several techniques, such as irrigation systems, to keep plant temperatures up. It’s still too soon to know how many crops might fall victim to the weather, not to mention the financial impact it could have on the commonwealth’s growing industry, she said. As for the apple and grape farmers who may be able to rest easy during these frigid nights, Lidholm said, some are concerned by what April may bring. Even though freezes are not common in that month, they are possible. “All farmers are very careful to hedge their bets, especially when it comes to weather, because you don’t know what is coming next,” she said.